What is the Doctors Personal Injury Program? This program has already been responsible for 803,000+ referrals to the chiropractic profession in 47 states with that number growing daily. The program has been extremely successful on an individual office basis, whether in a large city or rural town. Please review our statistics here. This program succeeds unlike any other in the industry because it focuses on you making your competition irrelevant. We work to ensure that you look as good on paper as you are in the treatment room and have the credentials in an admissible format to back it up. This is not a “one-size-fits-all” or a “get rich quick scheme.” Each office is personalized based upon your goals, and a concise business strategy is developed and customized to you. No two doctors are alike, and a constant level of communication is available to help guide you through the process. This program is not for every DC, it is only for those who aspire to the “best of the best through clinical excellence.” It is not about changing your chiropractic technique or philosophy. It is about managing your cases in a collaborative environment, where the referrals come to you, and you decide what happens next. It is about not losing a case to a physical therapist, who provides inferior spine care as a rule and not having your patients become addicted to opiates because they won’t need them while under your care. This program gives you the literature-based evidence to satisfy even the most skeptical about considering chiropractic as the first referral option for spine, and your credentials will ensure that your local competition becomes irrelevant. The secret to the longevity of this program and why doctors rarely drop out (although our agreement says you can leave at any time for any reason) is because the program changes every week. Dr. Studin consults doctors in 47 states, has lectured to over 250,000 plaintiffs and defense (insurance company) lawyers, bench bars (judges) and claim’s adjusters in 33 states. He also consults for large and small medical groups, private and university hospitals and individual medical practice. It is through the daily interactions and integrating all of the above enables him and his team to determine future trends in the chiropractic and personal injury genre`s. This allows the team to keep our doctors prepared 6-8 months in advance and is the cornerstone of why our make more money. This program is unparalleled in the industry and will teach you how to make your competition irrelevant because no one else has access to that level of information. 1,500 individual educational written, audio, visual and media modules... INCLUDED! UNLIMITED telephone and email consulting and technical support. *What is the "Colossus to the Courtroom" Program? 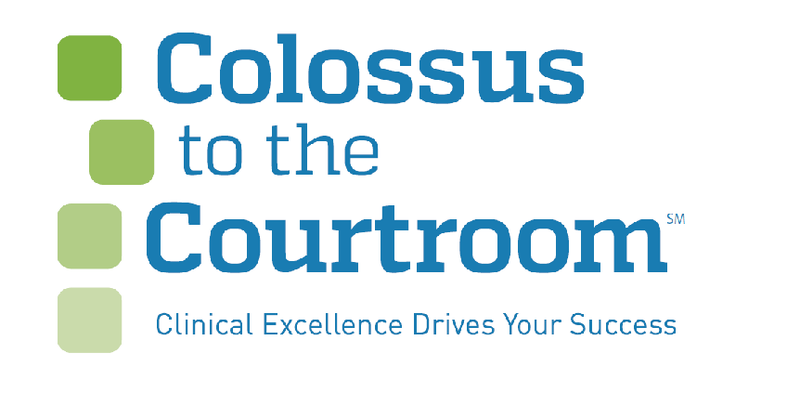 The "Colossus to the Courtroom" Program is also included in your monthly fee. This program is critical to personal injury success in today's marketplace. Responsible "Colossus type" documentation is about settlements, while the courtroom is about the end-game for the lawyers. Our entire Colossus paradigm comes from many sources both in the insurance and legal industries along with being guided by Mr. James Mathis, former Allstate Representative and State Farm Superintendant. This entire program allows the lawyer to use you at every level (although you will rarely end up in court). Without the lawyer being able to take you to their "end-game," the courtroom, most will not start with you if they cannot finish with you even though again, they know you will rarely end up in court. For the legal community, that is called leverage in negotiations and you must be their leverage. Once a lawyer realizes that you are not the real deal, you become a one and done in their eyes and it destroys your reputation...often forever! AND... To follow the Colossus program...it is so, so easy! This level of information allows you to become the lawyers direct resource for both settlement and verdict.